Dr. Nicholas Nguyen, director of pediatric dermatology at Akron Children’s Hospital, talks about how to avoid skin damage from the sun. The sun sustains life on earth, but too much sun can be dangerous to a child’s health. The sun emits ultraviolet radiation (UVR). In heavy doses, this can damage the skin. A sunburn is a visible type of sun damage. UVR can also cause invisible damage to DNA, the genetic code of the skin. These changes increase risk for developing skin cancers later in life. UVR also accelerates skin aging, leading to wrinkles and uneven tone at an earlier age. My child has darker skin, tans easily and rarely burns — do I still need to worry about the sun? Yes. The sun can damage the skin even if a child does not burn. Our skin contains pigment called melanin. Skin that contains more melanin has an olive, brown or black color. Melanin protects the skin from sunburns and can reduce the risk for skin cancer. However, even children who never or rarely burn can still develop skin cancers and premature skin aging later in life from excessive sun exposure earlier in life. 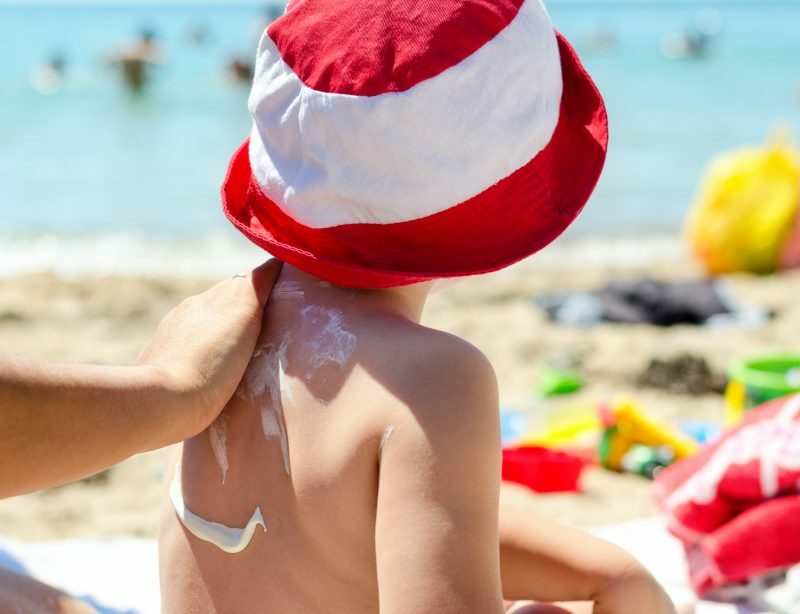 What is the best way to protect my child’s skin from the sun? The sun is most intense between the hours of 10 a.m. and 4 p.m. The sun is also stronger at high altitude and in areas closer to the equator. Snow, white sand and water reflect sunlight making rays even stronger. Avoid times of peak exposure, and take extra precautions in these situations. Tightly woven fabrics block UV light. Covering your child’s skin with sun protective clothing is more effective than sunscreen. A wide-brimmed hat may be worn to protect the head and neck. Sunglasses with UV protection should be worn to protect the eyes and eyelids. Apply a broad-spectrum (UVA and UVB) sunscreen to all exposed skin not covered by clothing. Sunscreen should be applied 30 minutes prior to exposure and reapplied every 2 hours. If swimming or sweating excessively, sunscreen should be applied more frequently. Select a broad-spectrum sunscreen, which protects against both UVA and UVB and has a Sun Protection Factor (SPF) of at least 30. Sunscreens may contain either chemicals that absorb UV light or minerals that reflect UV light. The mineral-based sunscreens contain either zinc oxide or titanium dioxide. These sunscreens block a wider spectrum of light and tend to be less irritating to the skin of children. In infants, direct sun exposure should be avoided. Protective clothing, wide-brimmed hats and shade structures are recommended. If sun exposure cannot be avoided, a mineral-based sunscreen may be applied to exposed areas only (i.e., face, neck, and hands). Spray sunscreens do provide protection from UV rays. Application tends to be less messy, and some children prefer these products over traditional cream-based sunscreens. They can be particularly useful on the scalp where it may be difficult to apply a thick cream. Despite these benefits, there are also several limitations. Special care must be taken to avoid accidental inhalation in children. For this reason, the product should never be sprayed on or around the face. Because these products are clear, areas of skin are frequently missed. For these reasons, I recommend applying a cream-based sunscreen initially and then consider a spray sunscreen in older children for reapplication. How should I treat my child’s sunburn? A cool bath can reduce heat associated with a sunburn. Hot baths and showers should be avoided as they can worsen stinging and itching. A thick, bland moisturizer (i.e., Vaseline) should be applied liberally to the affected areas. The moisturizer will reduce dryness and peeling associated with sunburns. Hydrocortisone 1 percent ointment and ibuprofen can help reduce inflammation and discomfort associated with sunburns. These medicines are available over-the-counter, but you should consult with your pediatrician or dermatologist about using them in your child.